A battle I have been fighting for a few years now is the idea that the most important exercises for hockey players are the exercises that are performed on an unstable surface. This type of approach demonstrates a severe lack of understanding in the training principles that are most deeply rooted within the sports science training literature and in fact govern how effective a training program is, or not. I talk about this in length within my article answering the question on whether or not hockey athletes should be training on unstable surfaces or not, which I highly suggest you read if you haven’t already for some greater context here. I don’t want this to be a direct attack because 99% of the time the people who say these things are genuinely good people who do truly mean well and just want to help hockey athletes. This is great, I love that. But, it doesn’t mean it is correct either—and it definitely doesn’t mean it should be the foundation of your program design. For a little bit of context, the parallel that is normally drawn is that squatting on a BOSU ball is superior to squatting with a barbell. Or, for some reason, stick handling on a BOSU ball is a good idea too, but I can’t even theorize why. However, when we apply unstable surface training for the purposes of maximizing sports performance, we run into several issues. #1) The “stabilizers” are not a distinct muscle group and are incredibly different for each exercise. This means it becomes very hard to logically program the “stabilizers” into a well thought out periodization strategy. Moreover, most of the people who are proponents of this type of training couldn’t even tell you which muscles are being hit or what the stabilizing muscles even are.How can you effectively program logical and measured progression for your athlete when you don’t know the muscle fiber type distribution, muscle insertion/origin points, pennation angles, biomechanics, or optimal exercises for stimulation? #2) Almost all “stabilizing” exercises are well below the volumes, intensities, and relative intensities required to promote ongoing strength, hypertrophy, and power development in advanced athletes. What you’re really getting here is extra fatigue within the stabilizers, and no way in which you can measure the optimal training frequency you should be applying on a week to week basis for maximal progress. #3) Stabilizing muscles for one movement are in fact a prime movement for something else. If you knew what stabilizers you were targeting, wouldn’t you want them fresh for their own training so that they could be the prime mover of their exercises and therefore you could create a greater stimulus for progress within that set of musculature?Your side delts are great stabilizers for BOSU ball pushups, but don’t you want them fresh for your row work in which you can apply a much greater and measured volume, intensity, and frequency on? #4) In some cases, some instability can be desirable. For example, I like to do about 2-3 weeks of ankle mobility/stability work with my athletes immediately after the hockey season to strengthen those muscles (which are the two divisions of the peroneals and the tibialis, mind you) because they tend to get weakened by being in a skate boot for the past 6-months or so. But, this instability creates a dramatic lack in potential force production within the compound movements. Heavy movements (8 reps or less) is largely useless because you’re not stable enough to create the max forces that would be required for you to place an overload (another principle violation) on the prime muscles of that particular movement. This becomes especially true if you are using dumbbells and not barbells, but they are still wasteful as you cannot create high enough forces to be able to effectively apply an overload stimulus to a muscle in the long term, or even within a single offseason.To put it short, instability can be useful in some scenarios in rare cases. But when you do so, you need to know which muscles you are actually targeting and not sacrifice the potential for progression you have within the compound movements (rows, presses, overhead presses, squats, etc). #5) Large muscle groups are the most impactful stabilizing muscles on our body. Our lats, erector spinae, chest, glutes, quads, hamstrings (and many others) are all gigantic for a reason—they stabilize our movement in the areas that drive the most force for athletic performance. For some reason, we are sacrificing the growth and strength of the muscles that impact our performance and injury prevention the most while simultaneously creating a training plan that focuses on the much smaller roleplaying muscles.Does this mean we shouldn’t train the smaller muscles? Of course not. They have their time and place.But, to create a program that minimizes the stimulation we can place on the most impactful muscle groups for hockey performance just doesn’t seem logical and doesn’t even come close to falling within the most important sport training principle of all time, specificity. #6) In order to effectively train for power (the rate at which you produce force, not the absolute amount), the literature is very clear that the velocity of your movement needs to be at 90% to maximally develop power. This is a problem is many cases because training on an unstable surface decreases the speed at which we can perform our exercises, well below 90%. So, right away we are training in a manner that doesn’t allow for power development and therefore doesn’t allow us to train for rapid force production. This rapid force production directly effects your skating starting speed, quick feet, agility, acceleration, shot power potential, and shot power potential with limited wind-up time.Huge factors to hockey performance, would you agree? #7) We can train for strength though on this equipment, right? Not exactly. Being on an unstable surface, you sacrifice speed of movement due to the challenges of balance, but going hand in hand with the challenges of balance you also sacrifice how much weight you can use in a given movement. Your weight on an unstable surface is a marginal fraction of what you could be using on solid ground. And when you’re sacrificing strength development you are sacrificing so many things related to hockey performance I couldn’t even go over it within this blog post. Some of which including top speed, shot power potential, fighting guys off the puck, winning battles in the corner, winning battles in front of the net, body checking, injury prevention, and a whole host of other factors.What’s ironic in the sense of sports physiology is that we have completely violated specificity in terms of hockey development here by sacrificing speed, strength, and power development that can DIRECTLY improve performance– and yet this equipment is often marketed as functional. That doesn’t sound very functional to me. #8) The last thing I think is important to address here is the “Well, it works for *insert random NHL player doing one exercise, once, on YouTube using equipment he is getting paid and sponsored by. *” I don’t know how this is even a rational argument, it says absolutely nothing about how a muscle function, how a muscle is stimulated, how a muscle adapts, and what key factors drive hockey performance. All we are looking at is a dude doing something once. The argument is flawed in so many ways I am actually doing an entire write-up on that topic alone, but, let’s discuss some of the important factors. First off, in many cases, these athletes are good in spite of what they do, and not because of what they do. An NHL player like Alexander Ovechkin might be an all-time great at hockey even though he’s never trained off the ice properly (this is just an example – I don’t know how Ovechkin trains). Maybe he’s so naturally talented on the ice, he could get away with training like a soccer player and still be one of the best hockey players in the world. Just because an athlete does an exercise or certain training program, doesn’t mean they couldn’t be even better if they trained on a program that had a structured periodization scheme and fell strongly within the principles of sports science training (specificity, overload, fatigue management, variation, phase potentiation, etc). Beyond this, the “it works for him” argument doesn’t make sense when arguing for something that works directly against hockey performance in many ways. In order to support this training methodology, you have to do a lot of ignoring of other really important points. Put another way, in order to make this type of training your mainstay for the majority of your exercises, you would go through the scientific literature and find a few great studies to support your point. BUT, along the way you would find a thousand more that didn’t support your point. You’re not a special snowflake, the laws of training are laws for a reason, THEY WORK FOR EVERYBODY. Why we would violate the training laws or basic muscle adaptation physiology because of a YouTube video is completely beyond me. To wrap this rant up, I want to make it very clear that I do in fact use unstable movements from time to time in my programming. But, it is never more than 2-4 weeks out of every year as beyond that point (except for special scenarios, rehab for example) it begins to have diminishing returns as you progressionally sacrifice speed and force production for stabilizing work. Not a good cost/benefit analysis for the hockey athlete looking to become as fast, strong, and explosive as possible. Additionally, when I do in fact use these movements it is for training known muscles under known stimuli and gaining known adaptations. Beware of the marketer, he won’t be able to answer these questions. If you want to learn the best way to train for hockey performance check out the Hockey Training Programs that we offer! Is Hockey Training Safe for Youth Hockey Players? Dan (or Coach Garner) is the head strength and conditioning coach and nutritional specialist at HockeyTraining.com. He holds 12 of the top certifications in both training and nutrition, as well as a formal education in both functional medicine and health science. Dan specializes in hockey performance, having worked with hundreds of athletes from the youth leagues, right up to juniors, AHL, KHL, and NHL. 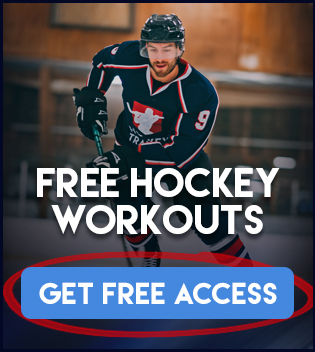 © HockeyTraining.com – Helping hockey players take their game to the next level.